RealMedia is a proprietary multimedia container format created by RealNetworks. Its extension is .rm. It is typically used in conjunction with RealVideo and RealAudio used for streaming content over the Internet. Recently, RealNetworks has developed a new container for VBR (variable bitrate) streams, named RMVB (RealMedia variable bitrate). 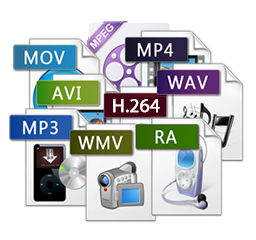 Support of RealMedia is available in a wide variety of multimedia players for different architectures/platforms, including RealPlayer and the Real Alternative codec pack. The open source DAP firmware Rockbox has added support for reading RM containers as of 2009, although only certain codecs contained in RM files are playable. RealVideo is a proprietary video format developed by RealNetworks. It was first released in 1997 and as of 2008 is at version 10. RealVideo is supported on many platforms, including Windows, Mac, Linux, Solaris, and several mobile phones. RealAudio is a proprietary audio format developed by RealNetworks and first released in 1995. It uses a variety of audio codecs, ranging from low-bitrate formats that can be used over dialup modems, to high-fidelity formats for music. It can also be used as a streaming audio format, that is played at the same time as it is downloaded. In the past, internet radio stations used RealAudio to stream their programming over the internet in real time.